As we know, Nexus smartphones have been put off the table by Google with no word being available about their release or existence. 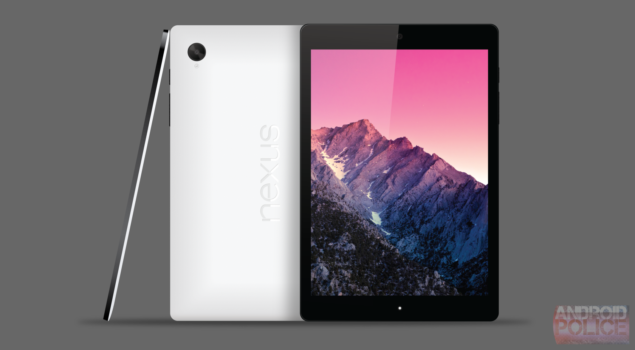 Information however has surfaced about a Nexus tablet in the works. The tablet is HTC’s Volantis and the information received by well known website AndroidPolice is quite extensive indeed. Apart from the final form of the device, information about specifications, features, price as well as the form factor is now available. In fact, the website claims the information to be quite concrete and different from speculations and rumors. 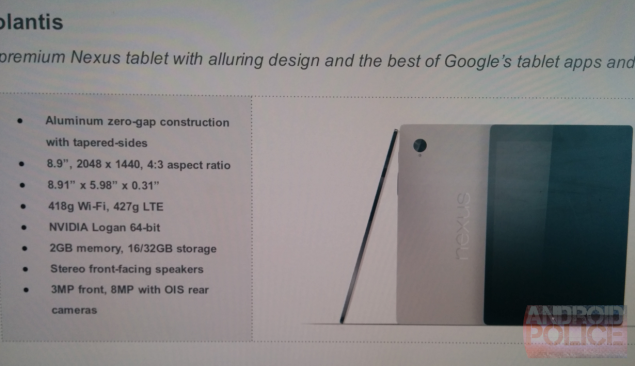 The tablet is referred internally as Nexus 9 and is to feature Nvidia’s Tegra K1 processor coupled with 2 GB RAM. HTC Volantis To Feature 2.5 GHz Nvidia Logan (Tegra K1) Processor. To Feature 8.9 Inch 2048 x 1440 display. The source image shared by androidpolice details several features of the HTC Volantis. The upcoming tablet will feature an 8.9 inch, 2048 x 1440 inch display with a 4:3 aspect ratio. Body dimensions of the tabet are to be 8.91 by 5.98 inches with a 0.31 inch thickness. It is to feature a Nvidia Tegra K1 processor, coupled with 2 GB of RAM and 16/32GB of storage. The HTC Volantis will have a front facing and a rear camera. The front camera will have a resolution of 3 Megapixels with the resolution of the rear camera being 8 Megapixels. The tablet weighs around 299g and will be constructed from aluminum with tapered off sides. Apart from the technical specifications of the HTC Volantis, information has also been provided about possible prices of the tablet. The 16 GB version of the tablet is expected to have a price of $ 399 and the 32 GB version of the tablet is expected to cost $ 499. These prices, of course exclude LTE connectivity, which will undoubtedly cost more. The HTC Volantis is expected to launch around Q4 this year.